On holiday on the Mediteranean island of Crete, I find myself sitting on the balcony of a small but very pleasant apartment listening to old favourites on my tablet. Vintage stuff, from the Beatles ( of course) the Beach Boys, Jerry Lee Lewis, Joni Mitchell, the Drifters, the Mamas and Papas, Roy Orbison and many more. No prizes for guessing my age, then. We’re on the north coast, in quite a small resort, called Gouves, and, it being quite early in the season, the weather is changeable. The resort is not as pretty as some of the places we’ve visited in Greece, although the coast itself is pretty. We are only yards from the sea and I do love being by the water. 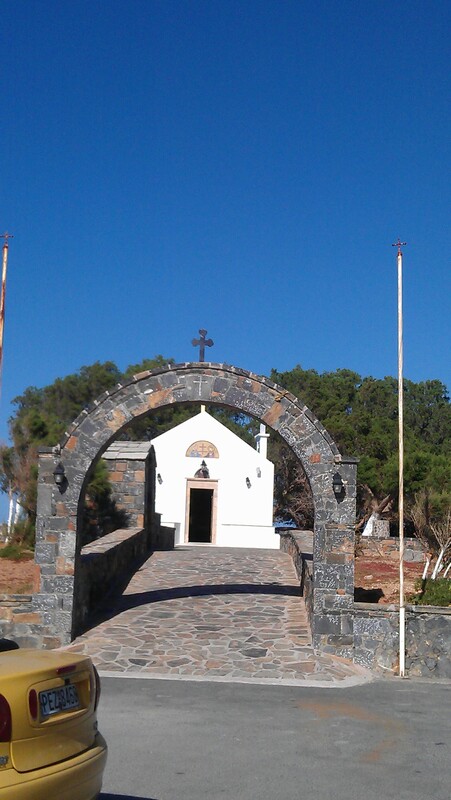 This little church is a hundred yards or so from where we are staying. The weather being, as I said, a bit changeable, I keep retreating to the balcony, either to shelter from the wind or to hide from the sun in the heat of the day. And what better way to spend the time than trying out some tangles? As I think I mentioned in a recent post, I’ve been looking at the work of Joanne Fink and if you haven’t looked at her Zenspirations blog, do. Being neither very original nor very good myself, I have been trying to imitate her style and it’s fun. An idea “borrowed” from Joanne Fink. If only I could draw like she does. 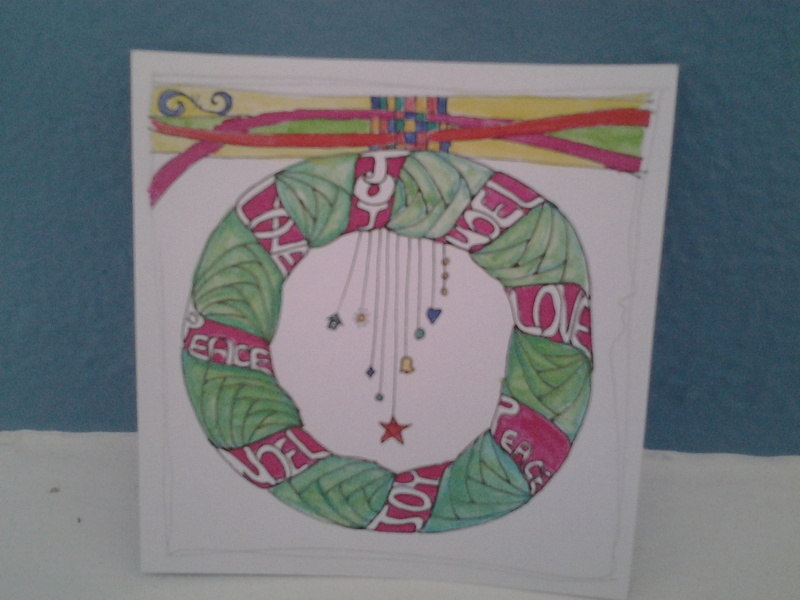 I’ve also started making toppers for Christmas cards, which is my pretence to be doing something useful. I’m using a mix of Joanne’s dangle technique, which is not as easy as it looks, and a few familiar Zentangles. In order to reduce bulk in my luggage, I packed a small set of water colour paints, rather than the Promarker pens I normally use but they don’t work as well. Perhaps it would be more truthful to say I am less skilful with them. 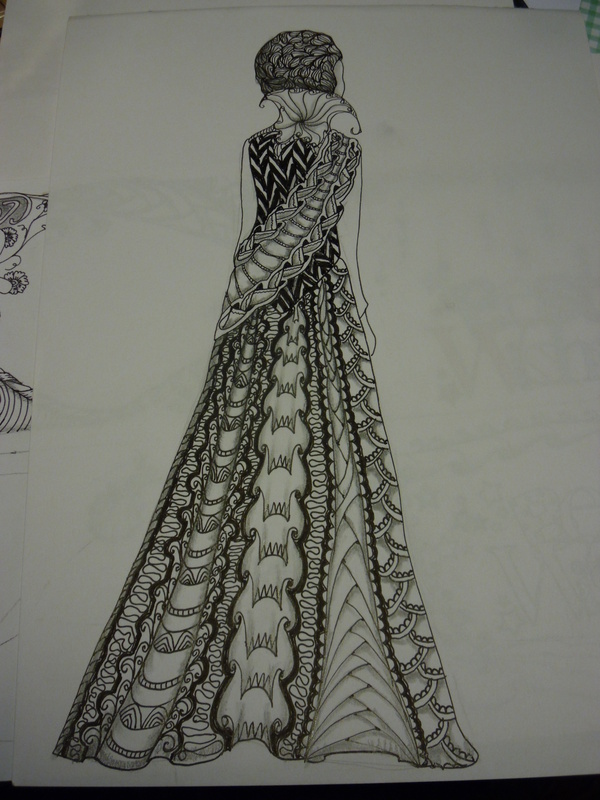 Either way, I’m less than happy with the results, I think I’ll stick to drawing and do the colouring when I get home. The wording will be coloured gold eventually. 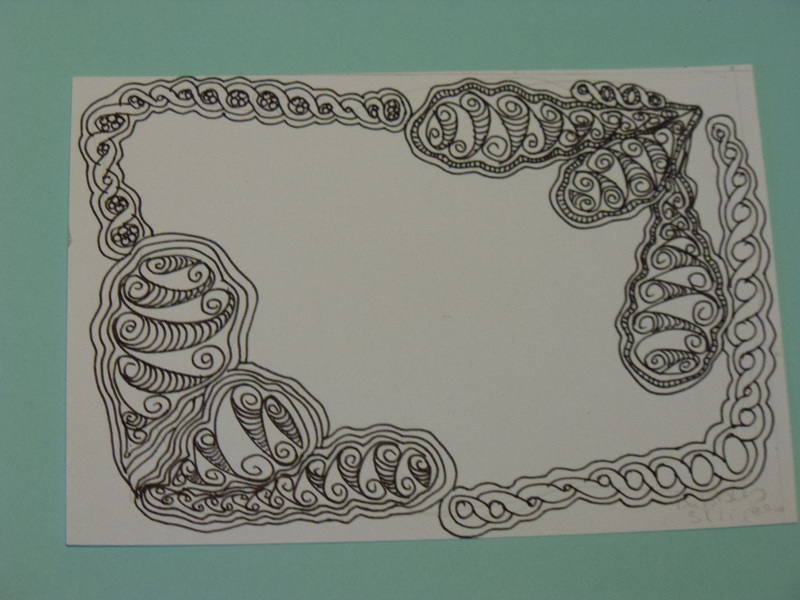 However, what with relaxing in the sun, the occasional glass of wine and the joy of Zentangle, I don’t think I could be more relaxed and stay conscious! Happy days. 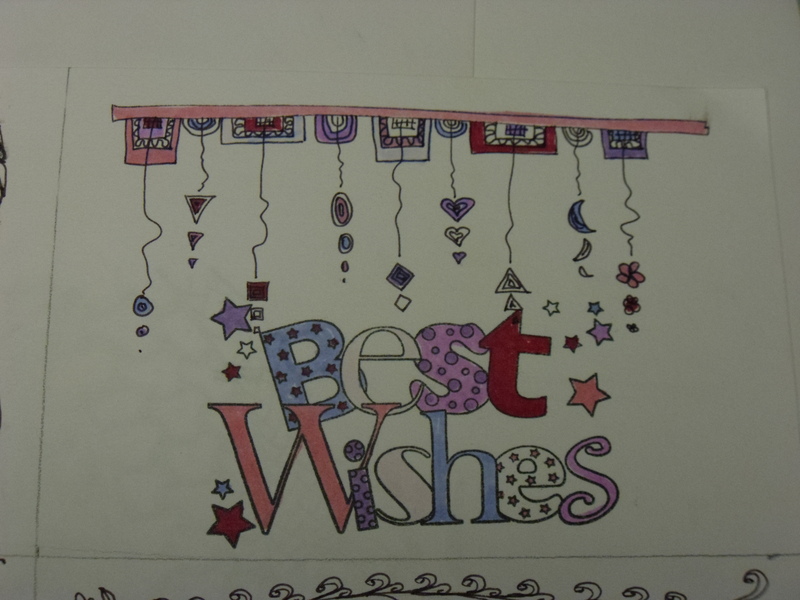 Although I haven’t done an inner for this yet, this is what the front of the card will look like. That’s it, then, as good as it gets. I think I quite like it, although I can see all sorts of ways to improve it. However, I’m at the stage where I feel every “improvement may be the one that spoils it. Stop while you’re ahead, Margaret. 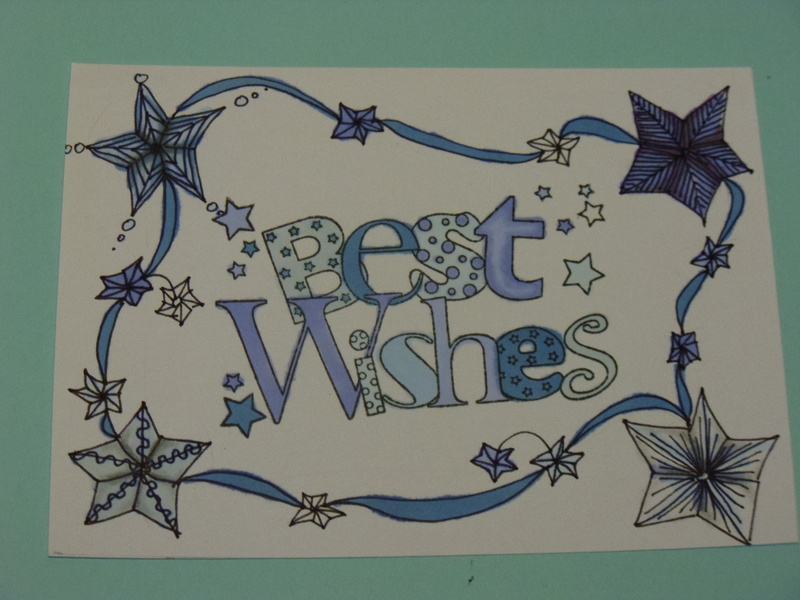 When I went on the Tangle Patterns website, just after I’d posted yesterday’s post, there was a video on it by Joanne Fink – http://tanglepatterns.com/2014/05/an-easy-and-elegant-technique-for-creating-hand-made-greeting-cards.html. It was excellent. The artwork looked, as always, deceptively easy but I gave it a go and am so glad I did. Now I’ve found TWO things that I can do and make something that looks attractive. 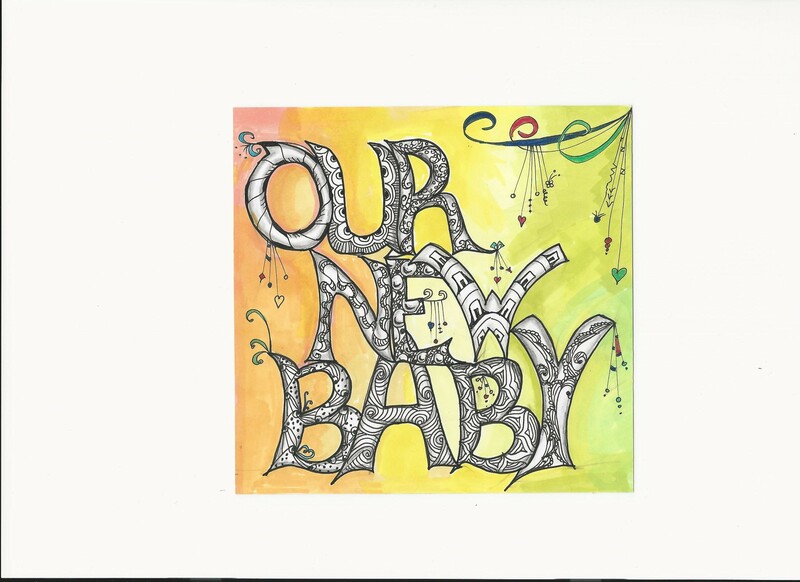 In the last few months, I have gone from being someone who would have liked to have been able to create artwork to someone who one day WILL be able to do just that. Can’t thank the Tangling community enough. My ambition now is to train with Rick and Maria as a CZT but since that involves a trip to the USA, it won’t happen any time soon. In the meantime, I’ll follow it all on Pinterest and across the web. 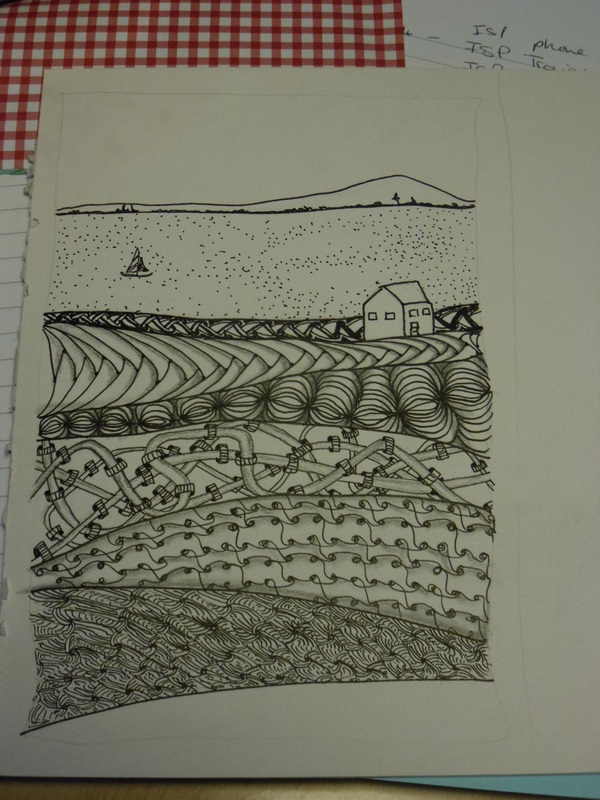 I had a pleasant afternoon with the tangles yesterday and came up with one of my own. Or, at least, I think so. So here’s a photo of a ZIA I made using it and filling it with different tangles. 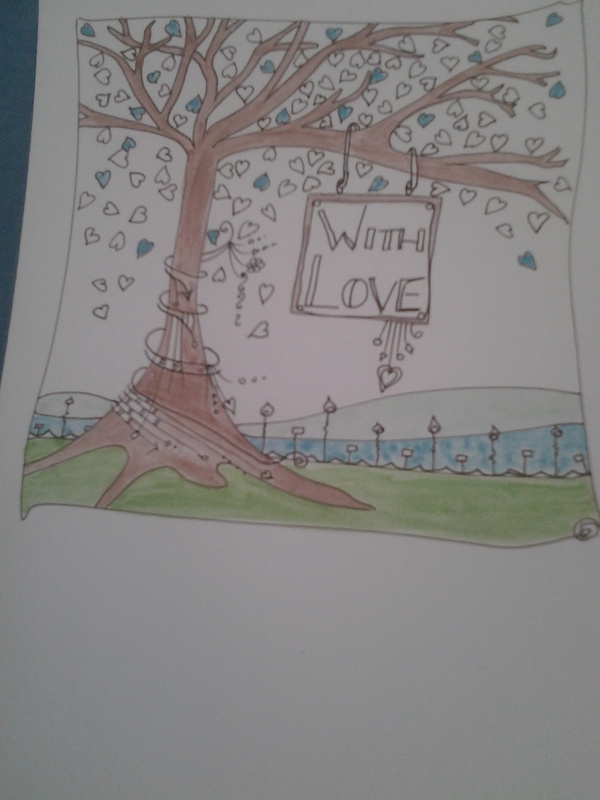 I then coloured it with Promarkers and I must admit, I’m not unhappy with the results. I called it Magtz, partly as a play on my name and partly because the first one I did looks a bit like a fat, juicy maggot. I’m not very experienced yet, although I’m spending hours tangling, but the more I do, the more I want to do. My current occupation involves going through the TanglePatterns.com website (http://tanglepatterns.com/about/how-to-use-this-site )and having a go at every one on the site. (In alphabetical order, of course.) There are hundreds of them, some more attractive to my eye than others but all with step by step instructions. The woman is a saint!! If I thought that mine was really original, I’d submit it to her but maybe not yet. 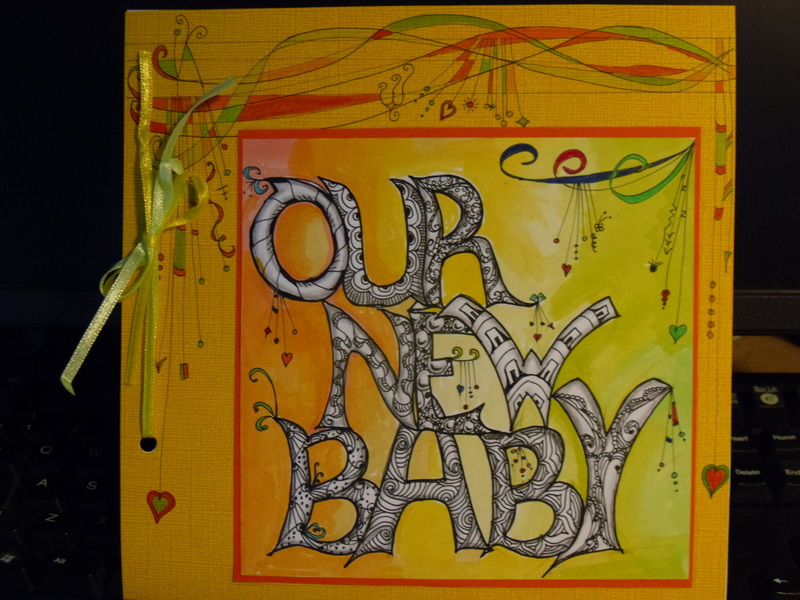 I then realised that our new grandbaby’s birth is suddenly imminent – it seems to have been one of the longest pregnancies on record – and I haven’t done a card to welcome him/her. Or, at least, I hadn’t. I’ve at least started it now, as this is the topper I’ve made. Again, I’ve used tangles and Promarkers, although I then added tiny details with water colour pens so they didn’t bleed into the alcohol based pens. Since we don’t know whether it will be a boy or girl and also I would prefer to avoid being too stereotypical, I’ve kept away from pink and blue. The result is better than I expected, so I’m going to stop now, before I try to decorate it too much and ruin the whole thing. I’m not sure if I should colour the words or not. Decisions, decisions! So angry I feel I have to share it with the world or I’ll explode. My daughter shared this on FaceBook and it just makes me furious. I’ve been overweight for years and am now in the process of dealing with it once and for all. (I hope.) I have done both Weight Watchers and Slimming World in the past and both were successful on a temporary basis. I never bought their food products because I genuinely believe I can do better home made but the cynicism of this just leaves me breathless. I’d like to force feed them on donuts until they explode! Similarly, I’ve been part of a project trialling Lighter Life products and I suspect the same can be said of them too. They provide meal replacement products and the idea is that you use them and only them two days out of five, with a sensible, low calorie eating programme (not a diet) in between. Since they call the two days on the products “fasting” and you eat about 600 calories per day on those days, you can see how successful it is likely to be. And it is. I’ve done it and have lost weight with it. But it is a weight loss programme, not intended to be followed for life. The plan is for you to get to a target weight using the products and then maintain by healthy eating. I applaud it and will do my best to do exactly that. The products, carefully balanced with proteins that stop you feeling hungry, (And they do.) don’t really taste very nice and most overweight people like tasty food. (Alright, ANY food, you may say.) The milk shakes, soups and solid foods all taste powdery and of artificial flavourings. I suspect they have more E numbers than M and Ms. So you can’t look forward to your “fasting” days and you just endure them. A friend of mine has decided to do the five and two programme for herself but instead of using the products, just eats mainly raw veg of her choice and keeps it down to 600 ish calories that way on her “fasting” days. I suspect she has the right idea and will lose weight just as effectively. Time will tell. OK, rant over for today. But go on, read that website, please. 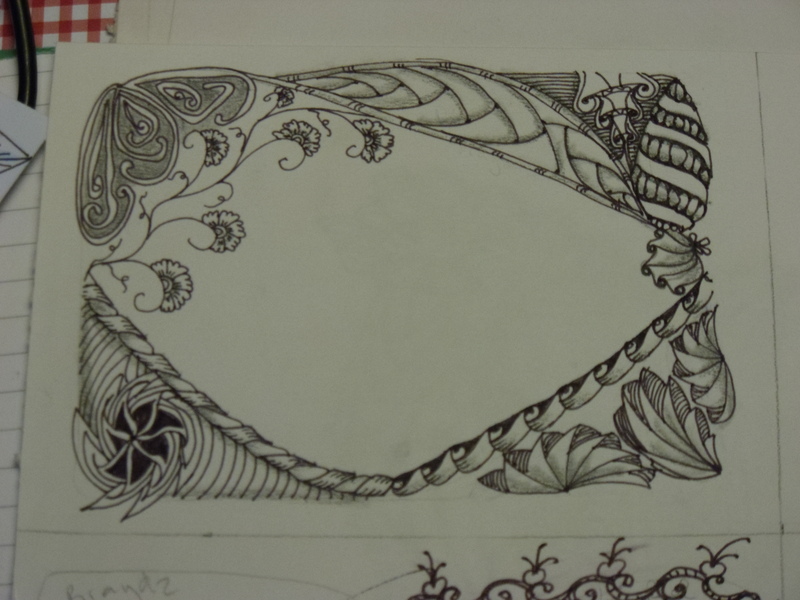 Zentangles or doodles, that is the question. 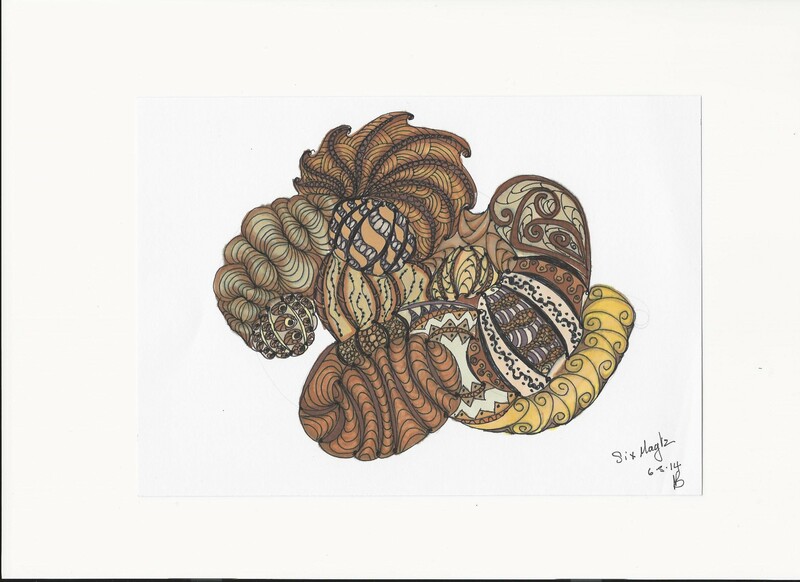 While we’ve been on holiday, I’ve been practising Zentangles from the website: http://tanglepatterns.com/category/a-tangles , which I can’t recommend highly enough. I hate to be as gushy as some of the contributors seem to be but it really is inspiring. And for people like me, who would like to be creative but just don’t have the drawing skills, it’s a godsend. Try it if you don’t believe me. So I took some small squares of card to practise on and three fine-nibbed pens, a couple of pencils, an eraser and a sharpener. They don’t take up much space but they provided me with hours of entertainment. Here, then, are some of the things I did. The stamp again but this time they’re definitely just doodles, not Tangles. 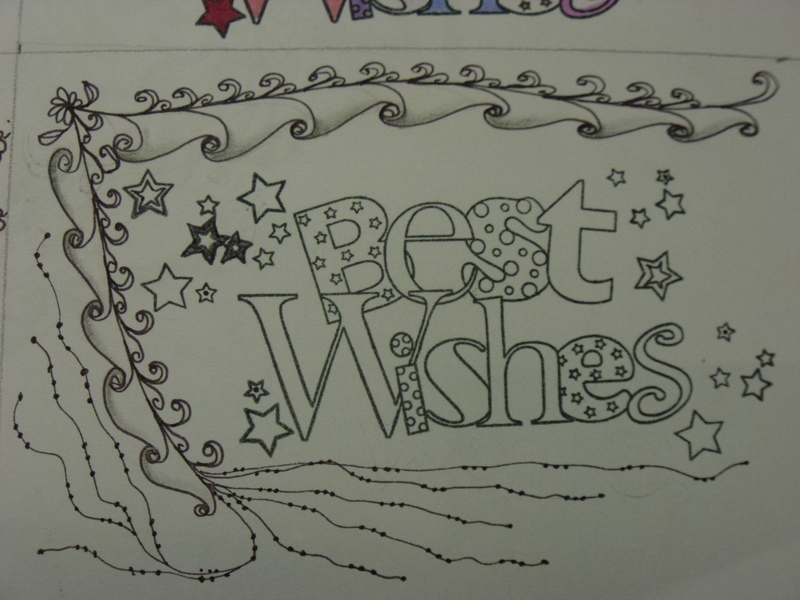 The greeting is a stamp but the stars and ribbon are drawn by hand. They are all based on a Woodware stamp I bought a few weeks ago and are in different stages of completion. The coloured ones use ProMarkers and I’m still getting to grips with shading techniques, as you can see. Both of the two above are unfinished and will need either colour or shading but will eventually become card toppers, like the others. I wanted to try several Tangles together to see if I could come up with a unified design. It’s not there yet because the bottom two bits don’t really fit in with the rest but I’m not entirely unhappy with it. 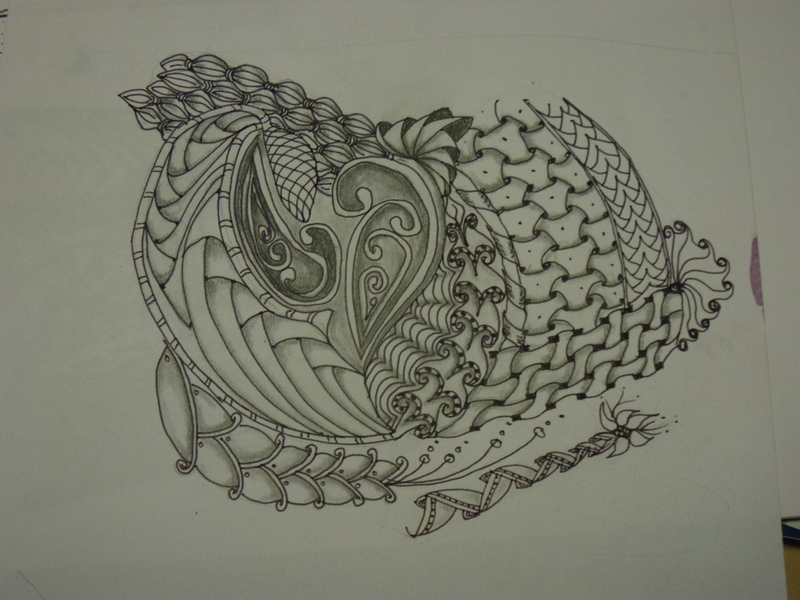 Not yet finished – awaiting some shading, maybe some colour too. Alright, this is an unashamed steal of someone else’s idea but I still like it and am looking forward to colouring it – if I ever decide what sort of a palette to use. I’ll put the finished product on here eventually and we’ll see how it goes. This is perhaps just a bit TOO ambitious but it was worth a shot and I really enjoyed doing it, even if it’ll never be a work of art. So, I’m off to try a few more. Have a look on the websites, I bet you’ll be blown away, like I was. I think today I have two things I want to share/get off my chest, so there will be two separate posts, I think. Maybe. The first is just a general bringing up to date. It’s a funny, not much of any kind of day today. We got back from a week’s holiday in the Canary Islands in the early hours of the morning and fell into bed, exhausted after a four and a half hour flight and a further one and a half hours on the road. And not a good flight either. Bad weather? Turbulence? Hijackers? Nope. Just crap service from start to finish. We flew with Ryanair, as we have done many times before. We know that they are cheap and cheerful. Well, cheap-ish and, last night for sure, anything but cheerful. This is not a rant. We don’t have high expectations of the equivalent of a bus service but… As I said, four and a half hours and it took two or more of those hours before the drinks trolley got to us. With no hot drinks left. And a rude cabin crew member who told us they had run out, it wasn’t her fault and then, when we pointed to the other trolley serving a hot drink even as we spoke, she didn’t even reply. (It was their last one, the girl hadn’t been lying, but she didn’t have the courtesy to reply.) Customer Service presumably doesn’t mean the same in Ryanair speak as it does to the rest of us. So we paid an inflated £1.80 for 250 ml of Sprite each, which wasn’t what we wanted but was pretty much all they had. That’s £7.20 a litre. And here’s the thing – exactly the same thing had happened on the outward journey. Not to us; we were in different seats and were served sooner but, by the time they got to the middle of the aircraft, they had run out of hot drinks. Shallow learning curve, don’t you think? Will we fly Ryanair again? Only if there are no alternatives. Anyway, sorry about that but I feel better now. The holiday, by the way, was a great success. We stayed at Royal Tenerife Country Club, with Diamond Resorts, a time share club of which we are members. Very satisfied members. 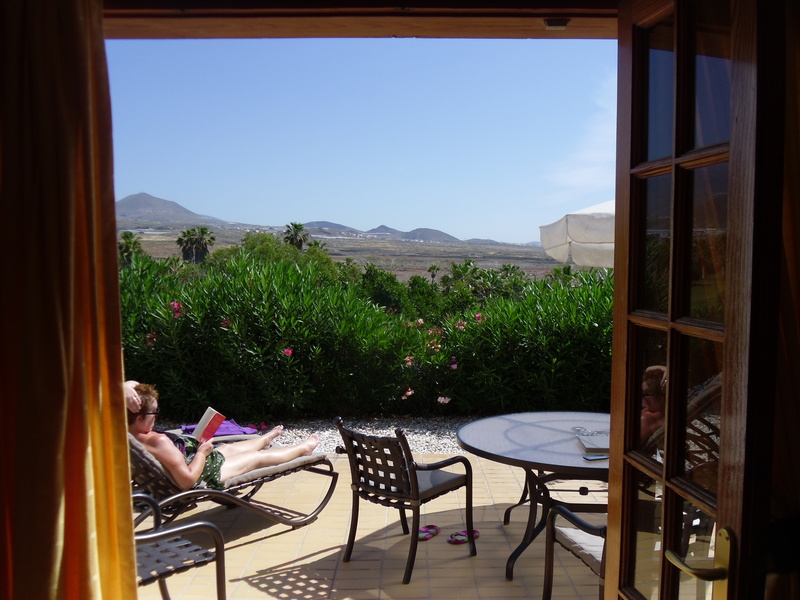 The quality of accommodation and service were just great throughout. See, I don’t only grumble, honest. Reading Malcolm Gladwell on the terrace in this, the best of all possible worlds, to slightly misquote Voltaire. The Club is a bit out of the way and I think we had pretty much exhausted the surrounding area by the end of the week, but we had a lovely, relaxing time, with a friend who couldn’t have been easier to share an apartment with and a couple of evenings out that were just superb. So may I recommend Restaurant Pata De Oro in San Blas? 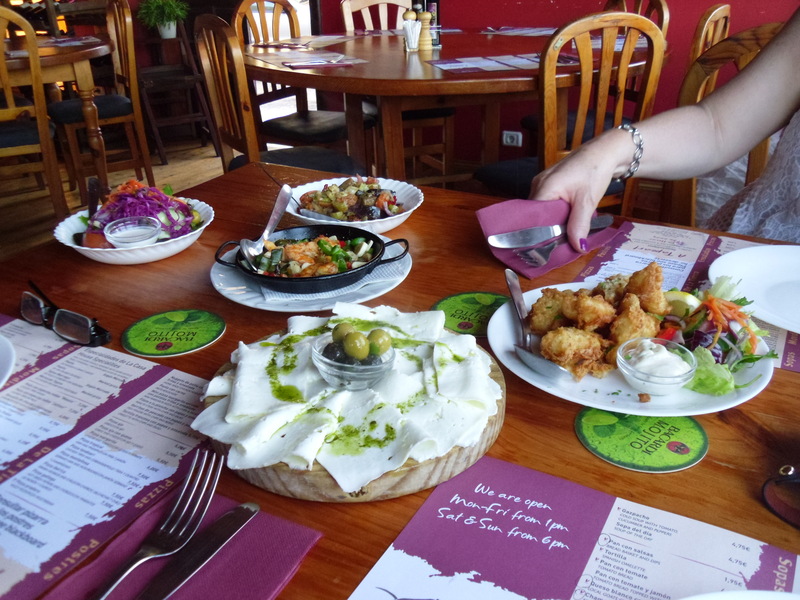 They do both A La Carte and Tapas and both were superb. 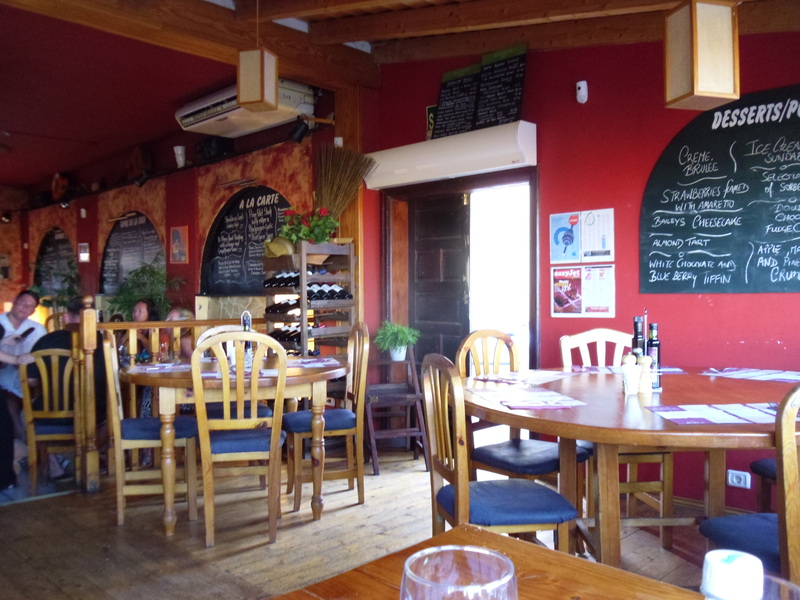 Restaurant Pata De Oro, San Blas, Tenerife. Well worth a visit. As I mentioned in the photo caption, I was reading a book by Malcolm Gladwell. If you haven’t read any of his books, do. He makes all sorts of complicated ideas easy to follow. He’s an American or maybe Canadian journalist and I just love his books. Only read two so far, but I’m working on it. And that’s it for post no1 today. Hope I can remember what the other one was supposed to be about.